Tanker surfing is real. We have seen the videos. When I moved back to Houston to start SURGE, I added tanker surfing to my mental list. A few weeks ago, I added it to my bucket list. And when I add things to that list, somehow it gets prioritized. This week, an energy entrepreneur invited me to go tanker surfing. Like most fishing / surfing stories, this one was epic. Rohan, co-founder of Exigo (Slack for the Industrial IOT), and I became fast friends. We are both energy tech entrepreneurs and fellow surfers. He emailed me earlier this week saying that the winds, tide, and traffic will be ideal for a Friday session of Tanker Surfing. In! Let me quickly plug Exigo and why I like it. During SURGE 1, we invested into a company called Revokom. They were building a communications platform post-Macondo (BP Oil Spill) that would streamline disconnected communication platforms (email, text, phone, smoke signals, etc…) into one…with one very interesting catch: the Asset (in this case, the oil rig) would be the central communication hub. In other words, depending on what your role was (as a company: operator, service company and as a person: mud logger, completion engineer, etc…), the asset would communicate to each individual based upon what is happening AND it contained the one system of record that would be archived and searchable. It was a great idea…BUT the industry (primarily baby boomers) were not ready nor were the enterprise systems capable of integrating. Fast forward to Slack (2013) that taught many of us that one platform using channels could be set up to collaborate, communicate, and make decisions around individual topics/programs, etc.. In the industrial world, not only do individuals need to communicate around specific topics, but assets themselves (the Internet of Things) need to communicate as well. Enter Exigo…they have created a Slack-type platform that integrates IOT into the “channels.” For example, if we were responsible for an offshore oil & gas production platform called “TankerSurfing1”, the Exigo channel “TankerSurfing1” would include key sensor data from the platform. When we go onto the channel, I can see all of the communications from other key users plus information and data from the asset itself. I am a believer. 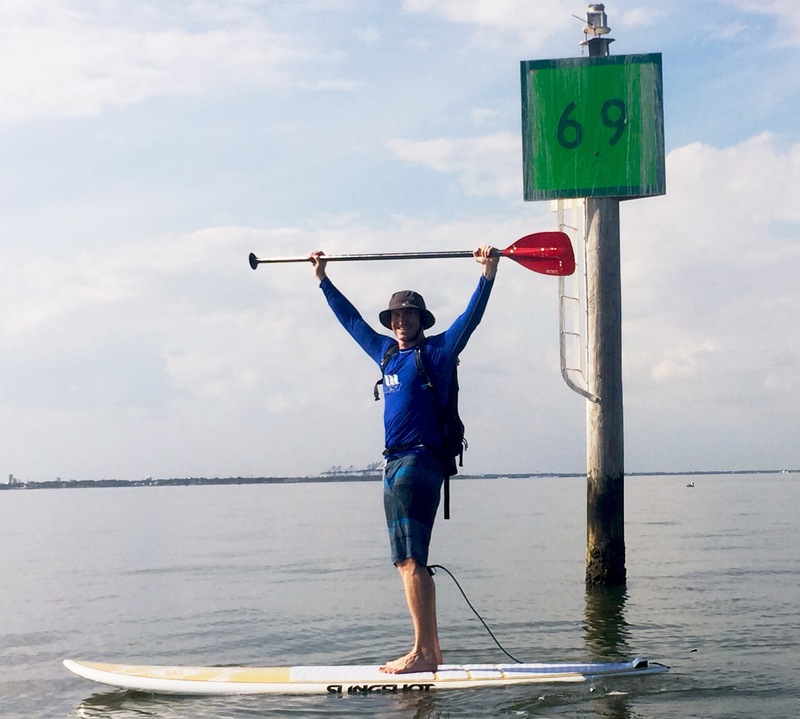 Rohan and I unloaded our stand up paddle boards, layered on our sun screen, secured our hydration systems to our backs, and kicked off of the El Jardin Beach (a tropical paradise in many ways surrounded by the oil & gas version of Detroit) and started paddling. Maybe it is the fact that we are both surfers or entrepreneurs, but I trusted that Rohan had a clue about where we were going. In other words, we both were in this for the journey and whatever happened, happened. 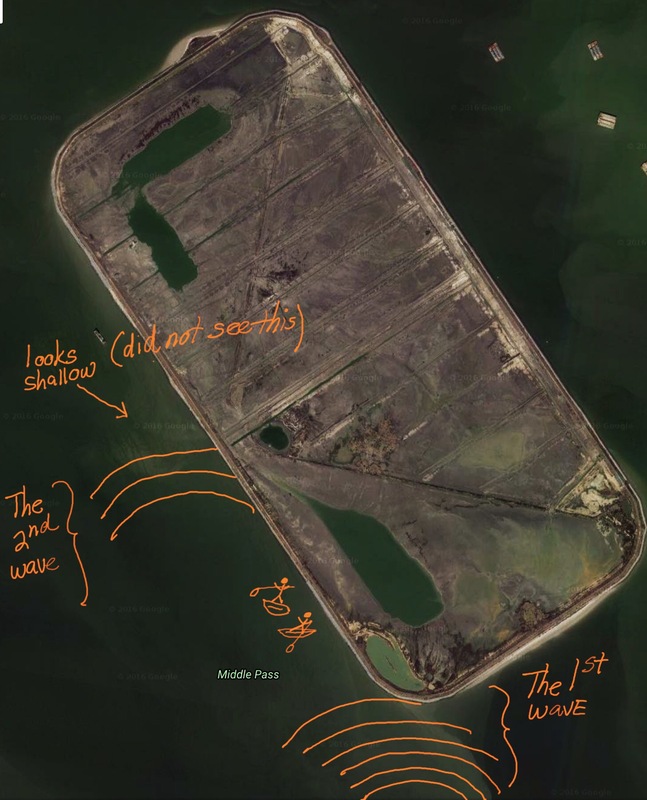 Using his iPhone, Google Maps, and MarineTraffic app (tells us exactly when and what supertanker is sliding through the channel), we paddled towards Mid Bay Island. THANK GOODNESS neither one of us did the math on the distance. We paddled and paddled and paddled… 1 hour and 45 minutes later, we made it. As a pelican flies, it is 6.74 kilometers. As you can see, our path to get there was really more like 8 kilometers taking into consideration wind, current, waves, and our form. Unfortunately, my Fitbit inaccurately categorizes this exercise as “SUP Touring.” It felt more like SUP racing. The paddle out was amazing. We saw dolphins cresting the waters just yards away, jellyfish suspended in flight swimming aimlessly, and schools of fish everywhere. The cool part for me was that as we got closer and closer to the passing tankers, the fire inside of me burned brighter. When we arrived next to the channel, Rohan and I had to figure out when to paddle across in order to dodge the passing ships. To catch a wave near Mid Bay Island, we needed to be between the channel and the island. Between Noon and 1:45 (when we arrived next to the edge of the channel), there must have been dozens of ships that passed. And the channel is so narrow, supertankers pass within feet from one another. When coming into port, the tankers are on the starboard side and vice versa (must be shipping code…but I don’t know. I have learned this fact dozens of times before but it is just not important to me to remember). Once we crossed the channel, there was a lull in traffic (of course…) and this gave us a much-needed break to sit down, eat, and rest our hands. A few cargo ships rolled by with dolphins surfing the bow. Speechless. After a few minutes, we saw a few large tankers headed our way. We jumped back on our boards and paddled up and down the island to determine the depth. In surfing, waves break in water half a deep as the wave is tall. We tried to find the shallow spots near the island in order to judge the best position to catch a wave. A few tankers passed by and nothing happened besides the expected wakes. Rohan, via MarineTraffic, was looking up the total tonnage of each tanker. We learned that a tanker must be 100,000 tons or more to create the types of waves that can be surfed. This was our conclusion after one day. The app told us that there were two large tankers heading our way. The one going out to sea was first…but we were not sure if they had enough speed nor was large enough to create a swell. What makes the experience so surreal is that we can see the tankers from far away and their speed is hard to judge. As the tanker passed, we looked for a wave…nothing. We then looked out for the supertanker coming in…we started to paddle towards it. It was 110,000 tons. It was a big one. Out in the horizon, we thought we saw a dark line. My heartbeat raced. As we paddled closer, the dark line rose higher above the horizon. What was it? And then we saw it…a wave about chest high was curling out before the island. There must be a sandbar. The wave was huge in our minds. We paddled harder towards it. And then…the wave died. We could not figure out what happened. And then we saw it…another swell started to form. We started paddling towards it and then turned to catch it. Rohan hit the deck to paddle (prone like a surfer) and I stayed up to paddle like an SUP’er. As the swell reached us, it was just not large enough to catch. It passed right underneath us. And then…the wave JACKED UP in front of us as we were clearly on the backside and started to break…and it kept breaking all the way down the island… It was an amazing wave and we missed it. Super Tanker = 1, Surfer = 0. We were bummed, stoked, and realized that supertanker surfing was very real and very rideable. We were giddy. Rohan checked the app…no more tankers for the day. We were done…but we saw the snipe, the Sasquatch, found Atlantis. We didn’t care that we lost. We won from the beginning. We were outside, on the water, with amazing weather, on stand up paddle boards. And we got to hang out as friends, fellow surfers, and energy tech entrepreneurs. It was time to head home…90 minutes later, we reached El Jardin…mission accomplished. 4.5 hours, stoked, blistered, ready for a cocktail, and already checking the weather for our next adventure. Stay tuned…if you want to come next time, let us know. Seriously…we do too. Trying again soon. Maybe it is the fact that we are both surfers and entrepreneurs, but I trusted that Rohan had a clue about where we were going. In other words, we both were in this for the journey and whatever happened, happened.